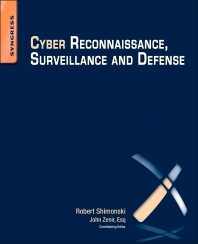 At a time when online surveillance and cybercrime techniques are widespread, and are being used by governments, corporations, and individuals, Cyber Reconnaissance, Surveillance and Defense gives you a practical resource that explains how these activities are being carried out and shows how to defend against them. Expert author Rob Shimonski shows you how to carry out advanced IT surveillance and reconnaissance, describes when and how these techniques are used, and provides a full legal background for each threat. To help you understand how to defend against these attacks, this book describes many new and leading-edge surveillance, information-gathering, and personal exploitation threats taking place today, including Web cam breaches, home privacy systems, physical and logical tracking, phone tracking, picture metadata, physical device tracking and geo-location, social media security, identity theft, social engineering, sniffing, and more.